A few years ago I didn’t know who the late Ayrton Senna was until it was the “Anniversary of Senna” on May 1st and a television news program covering highlights of his F1 racing career captured my attention. I never had much interest in race car driving as a sport or idolizing athletes, however good looking they are. But there was something about the footage of Senna. This curly haired seemingly petite but larger than life persona stopped my gaze from retreating to the computer screen, as it usually does every time sports coverage pops up on the evening news. As the Anniversary of Senna segment continued, I noticed my husband also stopping to watch. “Did you know this guy”? I said. I got the C’mon, Are You Serious? look. He told me the story of how he and his friends drove to the scene of Ayrton Senna’s death the day after he died. “What do you mean drove“? My husband replied that Senna died just twenty minutes from where he grew up. On the F1 track in Imola in Northern Italy in 1994 during a Grand Prix race. He recalled how the tragic death of the sport’s most highly revered driver broke the hearts of many Italians as well as the whole of Brazil, the country from which Senna descended. As that week went on, we both downloaded and watched the documentary of Senna and various online clippings showcasing his life and death. It was obvious Senna lived in a different world and with a different philosophy. I immediately admired him. 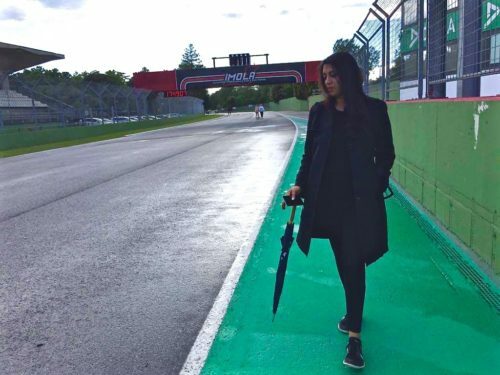 So three years later (and just a few weeks after a relocation to my husband’s hometown in Italy) when the 23rd anniversary of Senna’s death rolled around a couple of days ago, we dropped everything to visit the defunct F1 circuit in Imola. Read First Impressions of Moving to Italy. The circuit opens for walking to the public during certain days. As we strolled down the track on the Anniversary of Senna to the exact point where his car crashed straight into a wall instead of turning, I learned that the turn had been rebuilt immediately following the race as it was deemed too unsafe by F1. In reality, it wasn’t the turn itself. The overall conditions of the track cemented its reputation as one of the world’s most dangerous. Senna was not the first person to die here that weekend in ’94. 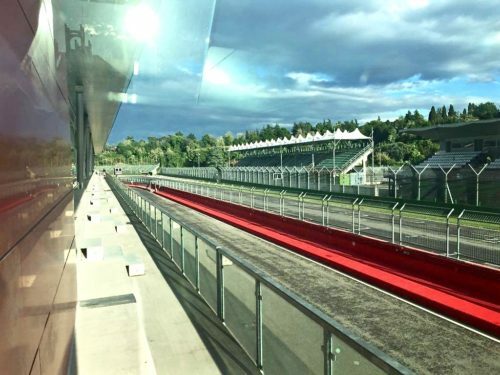 The track in Imola continues to host races but no longer hosts F1 Grand Prix’s. It looks pretty dated actually. I asked my husband why not and if it was because of Senna’s death. He said yes and no, it was more to do with money as is the case with all sports. The newer and shinier F1 tracks can now be seen in Abu Dhabi, Qatar and Shanghai whereas they were only held in Europe years prior. It was hard to imagine this venue holding an event of such grand scale. The F1 track in Imola was not how I pictured it. The speedway looked shockingly narrow and the stopping points minuscule, so different from how it appears on TV. I couldn’t imagine a car zooming down the tiny lanes at speeds of 300 km/hr. Forget that the cars are inches apart during races clamoring for the finish line. 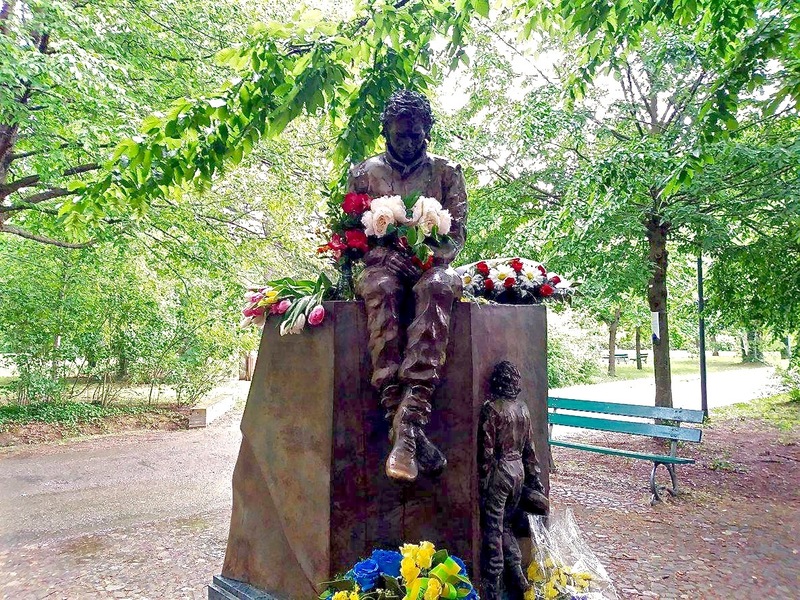 We exited the track and walked to where a statue of Ayrton Senna had been placed, just outside that fateful and notorious turn. 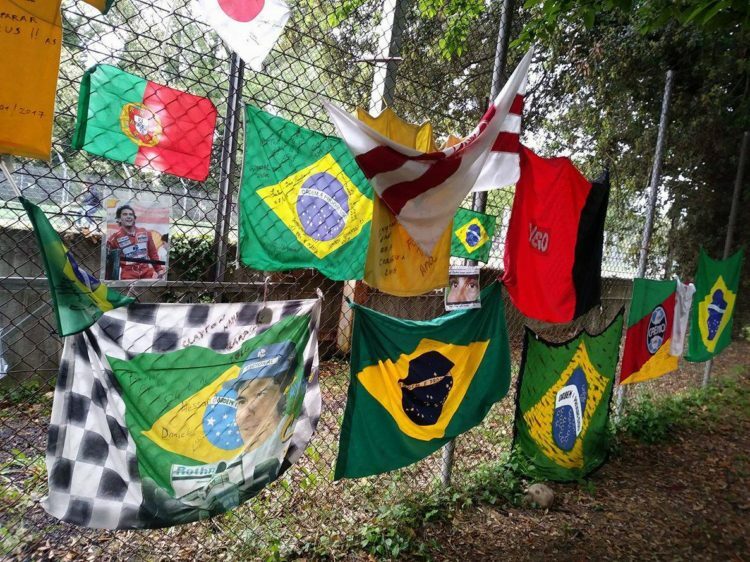 Flowers, messages, photos, country flags from all over the world and old jerseys with Senna’s name written across lay on the ground and tied to the fences. He was and is loved by many, not just for his racing abilities but for his salt-of-the-earth and of-the-people demeanor. It was palpable. I don’t have nostalgic childhood memories of watching Senna race down the track. But I’m glad I learned about him and had the opportunity to pay tribute. The Legend of Senna will long be remembered.